Lineup – Ingrid Laubrock: tenor and soprano saxophone; Ralph Alessi: trumpet; Kris Davis: piano; Drew Gress: bass; Tom Rainey: drums. 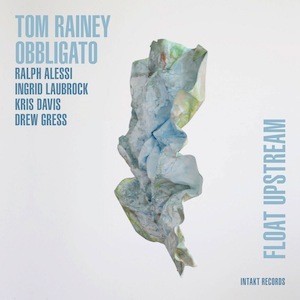 Multifaceted American drummer Tom Rainey reunited his all-star band Obbligato for their second outing, Float Upstream, following the same philosophy of picking out classic tunes from the Great American Songbook and transforming them according to a modern point of view. The quintet, both responsive and malleable, features Ingrid Laubrock on saxophones, Ralph Alessi on trumpet, Kris Davis on piano, and Drew Gress on bass, each of them staggering improvisers and distinguished bandleaders. The music passes a feeling of delight, showing the respect and admiration these adventurous musicians have for the repertoire, even if they’re mostly known for different voyages, certainly less accessible yet widely exciting. However, fans of their probing style can relax because the fearless, risky attitude and proneness for experimentation are all here, well adapted to the softer nature of the pieces, whose new aesthetics blooms under a loose-jointed predisposition. “Stella by Starlight” gives the example, opening the recording with a breezy Motian-esque flow hinged to the natural swinging environment. The melodic conversation between Alessi and Laubrock finds Davis as a meddler, each of them contributing to the balanced hybridity of tradition and modernity. Soaring like a feather in the wind, Sam Rivers’ “Beatrice” is subjected to a cultivated sonic treatment. The balladic journey starts with sophisticated trumpet lines over sparse piano textures. After interlocking bass lines and distinctive brushwork get aligned to build a solid ground, Laubrock’s saxophone pops up, weaving melodies in and out, as the gentle yet propelling swinging inflection takes over. An intrepid avant-jazz invasion takes hold of the uptempo “What is This Thing Called Love”, which features thoughtful horn interplay and a jagged piano exhilaration cooked up with intelligence. Here, the tune’s melodic statement can be glimpsed during the last seconds, but on “What’s New” it's perfectly recognizable from the beginning on account of Davis, who never abandons the main melody completely, exploring around it. Before she appears, one may indulge in Gress' solo bass intro populated with gorgeous woody phrases, elastic slides, and brief quick trills. The saxophonist, less expansive than usual and working alongside Alessi, still tosses a few elliptical punches to keep things interesting, wrapping up the piece with melodic clarity. Brandishing his unique sound and advanced rhythmic discernment, Rainey opens a surprisingly waltzing “There Is No Greater Love” with both wet and wry tonalities allied to other inventive percussive techniques. Expect nice call-responses throughout a soprano/trumpet improvisation. Before closing the session with another well-known ballad, “I Fall in Love Too Easily”, there’s time for the uncompromising title track, the only piece composed by the quintet, which swinging straight, also explores boundlessly. Only talented musicians create edgy perspectives from traditional forms and structures. Rainey’s Obbligato does it charmingly with a selfless commitment.